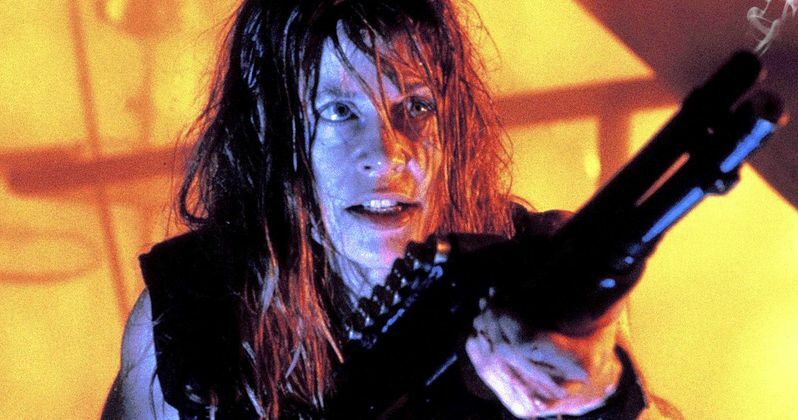 Linda Hamilton is ready to save the planet as Sarah Connor once again. While Terminator 6 hasn't yet started filming, the movie is in the pre-production phase and is gearing up to shoot in the near future. Originally, the plan was to shoot this summer, so all of the actors were preparing as such and were getting into shape for their respective roles, Linda Hamilton included. Now, thanks to a new photo that has surfaced online, we have our first glimpse at the actress back in shape looking like the hero from the Terminator franchise we all know and love. While this isn't a set photo, the image was posted by the folks at Linda Hamilton Fans and showcases the Terminator and Terminator 2: Judgment Day star looking ready for what lies ahead. It's been so long since we've seen Hamilton as Sarah Connor that it's just good to see her looking like she's ready to roll film. Emilia Clarke did her best to capture the character in Terminator: Genisys, but based on the fan and critical response, most people simply didn't feel that worked out. There's nothing quite like the real thing. In addition to having the original Sarah Connor back, Arnold Schwarzenegger will once again be reprising his role as the T-800. Unfortunately, the iconic action star recently had to undergo some pretty intense open heart surgery, but he's recovering and is still on track to appear. Coincidentally, Paramount bumped the Terminator 6 release date back from July 2019 to November 2019 shortly after the news of Schwarzenegger's heart surgery came to light. The studio claims the two things were unrelated, but it does seem to be awfully convenient timing. We also recently reported that Gabriel Luna, best known for his work on Agents of S.H.I.E.L.D. as Ghost Rider, has landed the role of the new Terminator. Natalia Reyes (Lady, La Vendedora de Rosa), Diego Boneta (Scream Queens) and Mackenzie Davis (Blade Runner 2049) have also boarded the new cast. Director Tim Miller (Deadpool) and James Cameron, who is heavily involved as a producer but couldn't direct because of his Avatar commitments, are hoping this will kick off a new trilogy. So these new stars could become very familiar faces. Plot details for the movie are currently being kept under wraps, but we may get some sort of synopsis or clue as to what we're in for once filming gets underway. During Cinemacon, a logo was shown that appeared to confirm the title for this new entry in the franchise will simply be titled Terminator. We'll be sure to keep you up to date as any new details on the project are made available. Be sure to check out the Linda Hamilton, courtesy of the Linda Hamilton Fans Facebook page, for yourself below.